Forking a repository is NOT the same as transferring it. Forking just creates a copy of the original repository. If you create a new repository under your account with the same name as the transferred repository, existing redirects to the transferred repository will break. Instead, use a different name for the new repository. To transfer a repository owned by your organization to another organization, you must have admin or owner permissions in the originating repository and repository creation permissions in the receiving organization. If Allow members to delete or transfer repositories for this organization has been disabled in the originating organization, only organization owners can transfer organization repositories. If Allow members to create repositories for this organization has been disabled in the receiving organization, only organization owners can transfer repositories into the organization. Once a repository is transferred to an organization, the organization's default repository permission settings will apply to the transferred repository. For example, if your default repository permission settings allow organization members read/write access, then all organization members can clone, pull, and push all repositories, including transferred repositories. Outside collaborators will still have access to the transferred repository and users with admin or owner access can add more members or outside collaborators and adjust their permissions. For more information, see "Permission levels for an organization." To transfer a repository owned by your organization to your personal account, you must be signed into your personal account and it must have admin or owner permissions in the repository. If Allow members to delete or transfer repositories for this organization has been disabled in the organization, only organization owners can transfer organization repositories. If an organization owner wants to transfer a repository owned by the organization to a team member's personal user account, then the organization owner must ensure that the team member has admin permissions to the organization so the team member can initiate the transfer themselves. 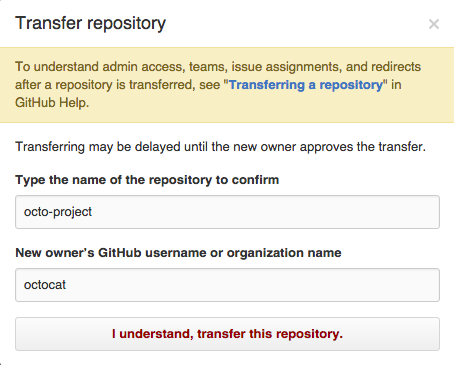 If you transfer a repository from an organization to a user account, only issues assigned to the repository's owner are kept. All other issue assignees are removed. Sign into your personal user account that has admin or owner permissions in the organization that owns the repository. If Allow members to delete or transfer repositories for this organization has been disabled in the organization, your user account must have owner permissions in the organization. Read the warnings and enter the repository name to confirm that you've done so. Type the name of the new owner and click I understand, transfer this repo. "Transferring a repository owned by your personal account"